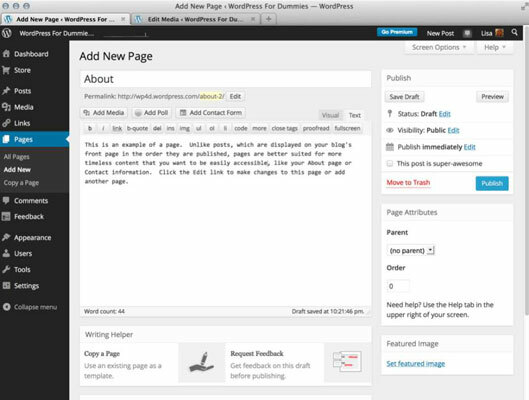 You can create pages on your WordPress blog that are treated differently from posts. These static pages appear as separate pages on your blog rather than as posts within your blog. You use nearly the same process of writing a static page as you do to write a post. You can easily create an unlimited number of static pages, which can serve as nice complements to your overall site content. You can use this feature to write, for example, an About page, on which you give all the wild and wooly details about yourself. If you use the Page Sidebar widget, the pages you create are listed in your sidebar; you can also add pages to the main navigation menu. Click the Add New link in the Pages menu. The Add New Page screen appears, and you can compose your static page. Type the title of your page in the Title text box. Type the body of your page in the Page text box. You can use the Visual Text Editor and insert media files into your page. Parent: Choose the page’s parent from the drop-down menu if you want to make the static page a subpage of another page you’ve created. Template: If the WordPress.com theme you’re using has page templates available, choose the template you want to use from this drop-down menu. Order: Enter a number in the text box that reflects the order in which you want this page to display on your site. If you want this page to be the third page listed, for example, enter 3. Scroll back to the top of the page and choose options from the Publish Status drop-down menu. These options are the same as the Publish Status options available when you’re writing a new blog page. Click the Save or Publish button when you’re done to save your work. Your static pages aren’t included in your Recent Posts list, in categories, or in your monthly archive.